It is very rare a movie will take my breath away. Wall-e is such a movie. It is so bold, lovely, magical, sweet, and everything else. One of my all time favorites. I know some people think it is boring. I don’t understand those people. I really don’t. Wall-e manages to be at the same time a great sci-fi, romance, silent and animated movie and it does all of those genres proud. Isn’t that interesting? It’s a mistake to believe kids need a complex plot to engage them. They need characters they like, doing things they like. I’ve seen small children watch movies of cows eating for an hour or a bulldozer clearing away land and be riveted. So it appeals to kids. Now we must ask the question- does it appeal to me. The answer is YES! Like I said, it is bold and completely charming. Let’s talk about why I like it . 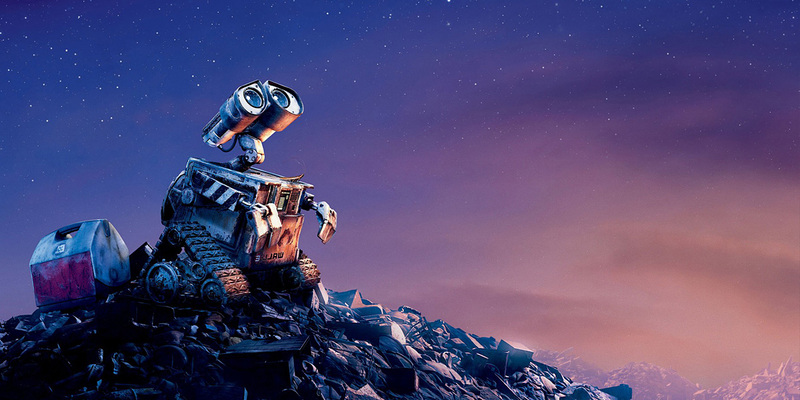 To begin with Wall-e has one of the strongest introductions of any movie. Immediately you are immersed in this world of trash and we see Wall-e going about his compacting ways. Once Wall-e gets home we learn he is a romantic at heart. In fact, he loves the musical Hello Dolly, which honestly is much better in this movie than on its own. You can feel Wall-e is lonely and who wouldn’t be with only a cockroach for company for 700 years. These early sections are virtually dialogue free except for the Dolly songs and I think they are completely brilliant. On one of his rounds of compacting Wall-e finds a plant inside a fridge and we can tell from his reaction he has never seen such a thing before in all his duties. Just about that time a visitor arrives. It is a girl robot that is more futuristic than Wall-e. Her name is Eve (or Wall-e says EVA). At first Eve is kind of hostile to Wall-e. She operates completely by directive and not by the seemingly free choice that Wall-e does. She shoots at him and doesn’t want him to touch her. Even after he shows her his home she’s still very jumpy. She also takes the plant and that sends her into a green mode where she needs to get home and notify the spaceship of the plants. But Wall-e persists and eventually the two have a moment. Again there is almost no dialogue during this whole time . I’m using so many clips because you have to see the beautiful imagery. That will sell you on the movie much more than my explanation of what it is. Eve finally gets picked up with the plant and Wall-e follows her, hanging on to the spaceship. It creates one of the loveliest scenes ever in animation with Wall-e and Eve in space. Once they arrive on the ship we do get a minor change in storytelling but to me it still maintains the tone and characters Eva and Wall-e that had been developed in the beginning of the movie. It turns out when the Earth was destroyed the people were sent to a spaceship with all that is needed for them to relax for what was supposed to be 5 years. Unfortunately 5 years turned into 700 and the people became very lethargic on the ship. They don’t even realize they are being inactive because they are always looking at the screens in front of them on their chairs. When two characters John and Mary get knocked off their chairs they realize for the first time there is a pool in the ship. That’s how focused they are on the displays in front of them. 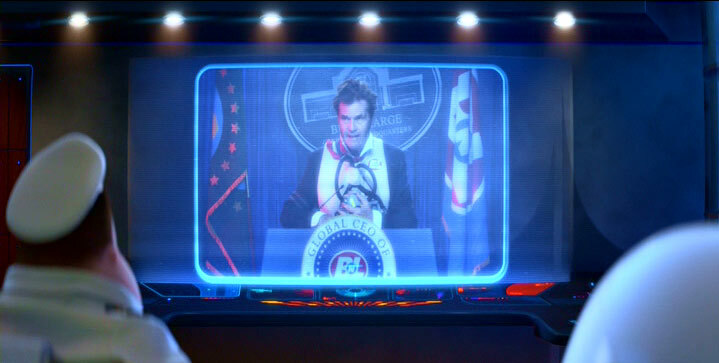 We also get introduced to the Captain voiced by Jeff Garlin. He is seemingly going through the motions but we see him grow in bits as he awakens to the stupor he’s been living in. He’s been reliant on an autopilot that looks a lot like Hal from 2001 Space Odyssey. This is an easy way of the directors to let us adults know the Autopilot is probably not going to be in the best interests of the people. When Eve gives the plant to the Captain the Autopilot goes into a ‘recolonization process’ but it quickly becomes clear the Autopilot has been programmed at the start to not allow a return to Earth. 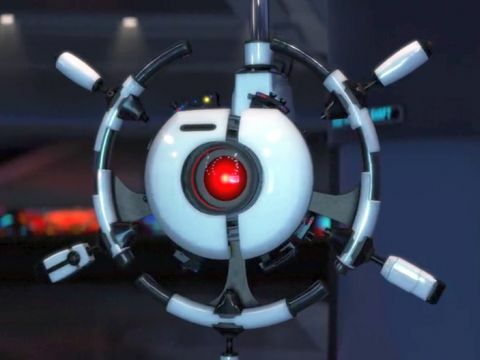 This creates a battle between Eve, Wall-e, The Captain and a few other machines that they are able to recruit. I really like the team of robots they end up getting together. Some people might see this as a different tone than the beginning of the film but I don’t. 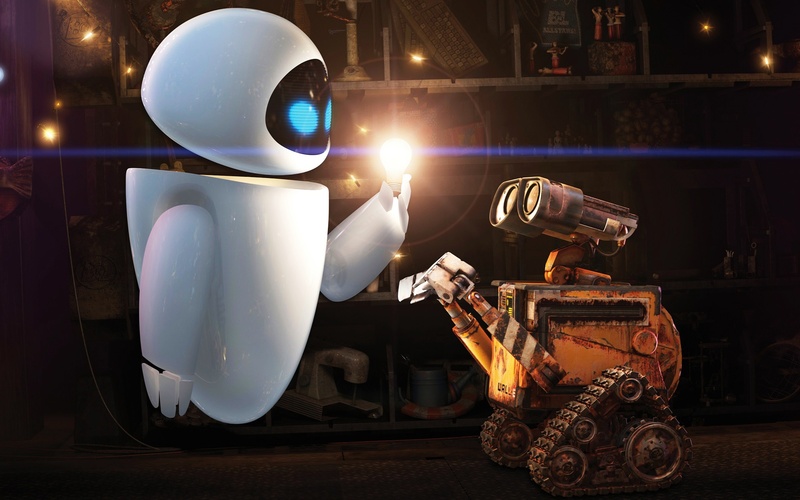 We still get those sweet moments between Wall-e and Eve especially when Eve thinks Wall-e is gone several times. To me it is a building of tone and like any great story it starts subtle and builds to a climax. Plus, we get lots of little hints at the ship and leadership in the early scenes with the piles of trash and so to me it makes perfect sense to have both sections of the movie. It also has moments of humor mixed in especially with Mary and John. I love when they stop the babies when the ship is tilted and she says ‘Get ready to have some kids!’. I guess if I was going to nitpick Fred Williard seems like a strange choice to play the CEO that sent the people to space. He is such a humorous actor I keep expecting him to do something funny but it really isn’t a comedic role at all. As we get to our ending Autopilot has been shut down and the plant found. The ship is landed and there is a real sense of hope that the people, fat as they might be, are going to make a go of it and that they will start a real life instead of just being floating nothings. And we get one of my favorite scenes in all of movies. Wall-e has a new memory chip and at first he doesn’t recognize Eve. It’s so beautiful! Make sure to stay around for the credits because we get to see Wall-e and Eve through the history of art. 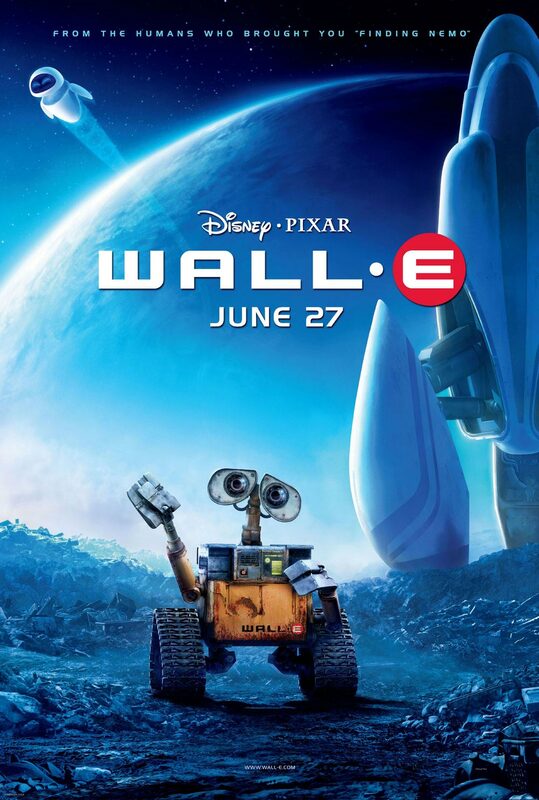 To me Wall-e has everything you could want in a movie. It’s stunningly beautiful. One of the most gorgeous animated films ever made- CG or 2D. It teaches a very important message about taking care of our environment and not forgetting it because of our devices. Even more it reminds us to continually challenge ourselves and that just doing nothing as fun as might be is not a fulfilling life. We see that with the Captain when he starts to learn about Earth and he gets more excited with each new discovery. At the end he glows ‘we can grow a pizza garden!’. I know I am sometimes tempted by doing nothing and there is a place for that but it doesn’t really lead to lasting happiness and you may miss things right in front of you that could give you joy- like Mary and John missing the pool. Aside from the message it covers so many genres and does them all well. It’s sci-fi, silent film, romance, space opera, and more. It blends it all seemlessly and with such heart that I find myself tearing up at the fate of these robots for goodness sake! Director Andrew Stanton made a truly unique work of art that is certainly one of my favorites. The score by Thomas Newman uses the songs from Hello Dolly, La Vie en rose and Stardust along with unique themes. I agree with Hello Dolly composer Jerry Herman who called ”its incorporation into the story is genius”. I think the movie is too long. To me it goes downhill as soon as it enters the ship and the human characters get involved. I always felt that the movie should have ended with Wall-E and Eve flying together into the universe, leaving it to the stupid humans to clean up the earth themselves. I know a lot of people feel that way. Not me but thanks for sharing. I have found the more I watch it the more the ending and the whole story grows on me. It’s a movie that definitely improves on the rewatch for me at least. I really do think Wall-e is a work of art. It’s not my favorite but I definitely appreciate it. It is totally art. I agree. My favorite is Up (coming up next!) but after that they are all so different it is going to be tough to rank. Wall-e improves for me each time I see it and I think good art is that way. I was a little ambivalent about there being no dialogue at first, but I was alright with it later on. This is definitely a great film for sure. Thanks for reviewing it. Again, I haven’t seen it again since I first saw it back in 2008. I’ll try to give this one a rewatch too. For now, I’ll probably go A or A+ myself. Great review again! I like to hear your thoughts on films, as well as others too. Thank you for being my biggest fan and never failing to encourage and support even when we do disagree. This is a movie that grows on me each time I see it. I just love it now. Awesome! Anyway, you’re welcome! I’be disagreed with some of your reviews along the way, for sure, but I’ve still enjoyed then nonetheless. Well, keep up the good work. Looking forward to your review for Up and all the other Disney/Pixar films that you still have yet to review. I’ve struggling with the Up review. It’s actually hard to write about your favorite movie. To convey it in words is tough. You’re welcome! Well, you get to it when you get to it, I guess. The Up review is up! I’ve loved this film from when I first saw it – yes the first act is some of the best silent cinema ever created, but I still think even the second and third acts hold up nicely! It’s incredible that a simple trash compacting robot like WALL-E can be surprisingly relatable in his emotions and humanity, and for some people even his struggle for friendship and love, as usual the contrast of technology demonstrated between him and EVE is always fun to watch. I also like that the ‘Axiom’ is not designed too creatively, it is a rather standard space cruiser but that’s the point of how by-the-numbers it is – if it was too creative and interesting we would probably be suckered in into thinking it was a great place to stay, the way that the humans look and act the same is also a smart move. I couldn’t agree more. I think it is probably the boldest film I’ve ever seen and that’s why I think it takes a couple viewings to appreciate it fully. I agree about the second and third acts. It’s really a movie about whether it is better to not struggle and things be easy or to be free and part of the world. When the captain see’s all the images of the dancing and life on earth his eyes are opened and it’s kind of an Eden-like moment. He decides mortality and really living is better than sedated nothingness. I love it. It truly is remarkable that such a moving story can come from such an adorable robot. Plus it does Hello Dolly better than Hello Dolly! Pingback: Did the Right Film Win? 2008 Animated Oscars | Reviewing All 54 Disney Animated Films And More! Pingback: Blindspot 1: Blade Runner Review | Reviewing All 54 Disney Animated Films And More! I do not know why people complain about the second half, when it was obvious from the very beginning that it was where the film was going to go. It was definitely a nice and creative film, which is very enjoyable. A very strong film.